STORK in RUSHES Interior - Exterior mould - Question Marks. (Dugan). STORK in RUSHES Bonbon - Marigold (Diamond). STORK in RUSHES Bonbon: When Travis showed this piece to us while attending the 2013 ACGA Convention Auction, it was quite a shock to see how well the familiar pattern had fit into the basic mould for Question Marks bonbons! The Dugan bonbon mould was sold to Diamond and the experimental insertion of the Stork in Rushes pattern apparently was never placed into production. Travis “found” this piece within the boundaries of Pennsylvania. Perhaps one of the former glass workers had kept this piece in his “clutches” for eons of years and only with his passing, did the piece find its way into the “collectors world”? Marigold CONSTELLATION Compote - S-REPEAT exterior. CONSTELLATION Compote: Marigold, amethyst, white, peach opalescent, white w/marigold stem, lavender are known colors. White seems to be the more prevalent color. One example of white w/marigold stem is known. Perhaps it was a “sample” which never went into production? When a frosty white compote having S Repeat exterior pattern is found, some collectors refer to it as Sea Foam. 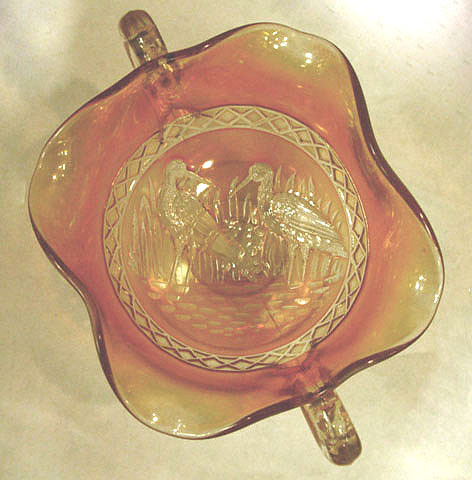 S-Repeat jelly compotes were produced in clear glass prior to the carnival glass era. Peach Opal Bells and Beads. BELLS and BEADS: This pattern receives little attention, yet it likely dates from the 1909-1911 production period. Some have been found in oxblood (black amethyst), indicating production in 1910 when that color was introduced. 7” in the round, there are also tri-corner shapes in marigold, amethyst, oxblood, peach opalescent and green. Triangular 7” bowls, card tray shapes and 7”-8” plate shape are found in amethyst and peach opalescent. 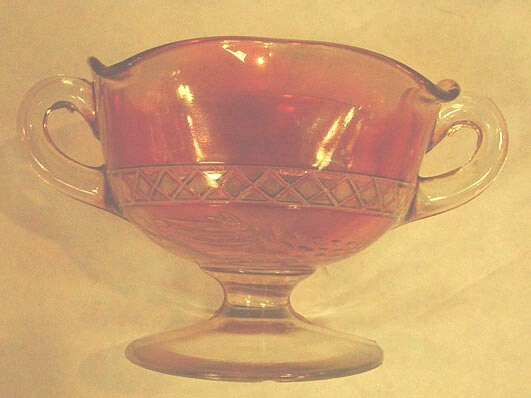 A rare compote shape is known in marigold and amethyst. Scarce handled nappies are known in marigold, amethyst, peach opalescent and oxblood. No white examples have been found. The Dugan white carnival line had been in production only a few weeks when the Feb. 1912 fire destroyed many of the moulds. Perhaps the Bells & Beads was among those lost. Description of : OXBLOOD: Explanation by Carl O. Burns in his Dugan-Diamond book describes the “controversial” colors of amethyst-black amethyst-oxblood as applied to Dugan patterns. In March of 1910, Dugan marketed a color named African Iridescent. The base glass color appears almost opaque unless held to a strong light source. It then becomes an exceptionally deep purple having a strong red tone…….Hence, the term “oxblood”. These examples of glass exhibit a brilliant iridescent blend of color, highlighted with a bright gold tone. Wreathed Cherry, Heavy Iris, Many Fruits, and Six Petals are found having such coloration. A bit further clarification: Oxblood “appears” shiny black until placed over a strong light source. NO light can be seen through true black amethyst. We have owned a black amethyst Corn Vase having fairly light golden iridescence. The late Roger Gladson was a collector of black amethyst and attained a sizeable collection of those pieces. Those of you who collected in the 1980s will remember his constant search for another example. SIX PETALS - Peach Opal. SIX PETALS: When a light is placed behind the oxblood Six Petals bowl, the basic amethyst tone is emitted. 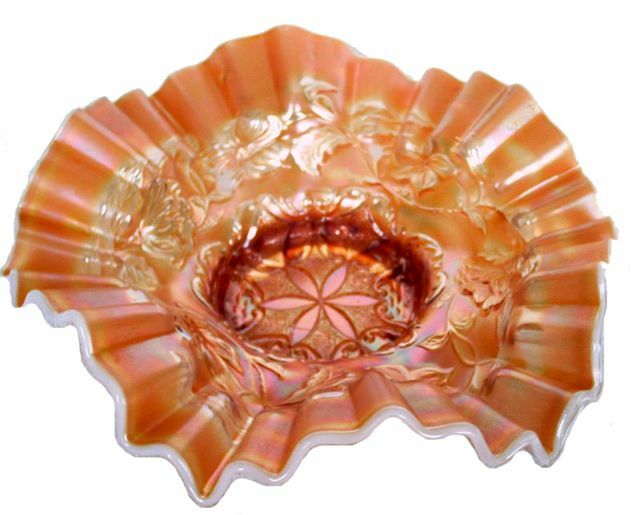 These 7”-8” ruffled/crimped bowls are found in marigold, amethyst, oxblood, white and peach opalescent. 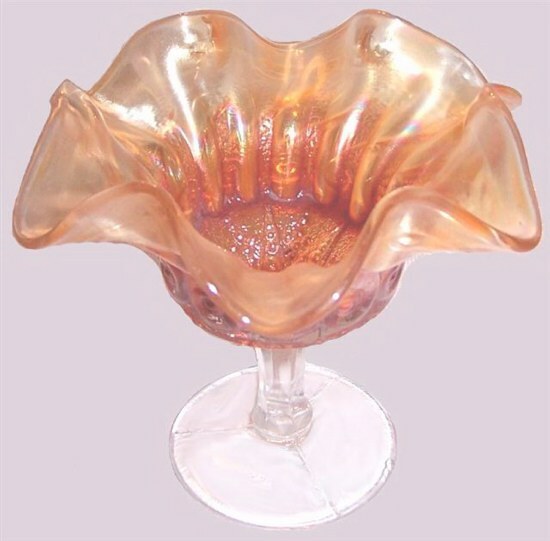 Triangular bowls are known in amethyst and peach opalescent. Many times this tightly crimped edge is called “candy ribbon edge”. FLOWERS & BEADS Exerior - RARE Oxblood. FLOWERS and BEADS Exterior - 6 in. Plate in Amethyst and Peach Opal. FLOWERS & BEADS: is a carry-over design from the earlier opalescent period in 1907. The carnival production of the 1909-1910 period would have been when this exterior patterned piece appeared. 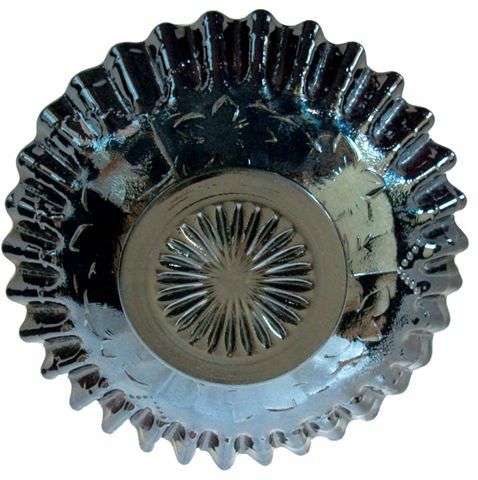 Used on 7”-8” flat plates, usually hexagonally shaped, they are not easily found. Lovely iridescence redeems the lack of pattern on the interior of the piece. Round, ruffled and some with CRE 6”-7” bowls are known in the pattern, with both shapes seen in marigold, amethyst, peach opalescent and oxblood. 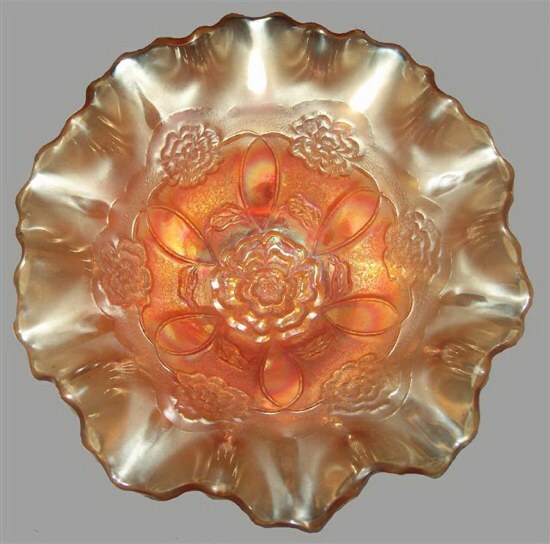 This exterior pattern was also used in combination with Fishscale and Beads interior found in 5”-6” ruffled bowls and 7”-8” round, flat plates having a fluted edge. 10-11 in. HEAVY GRAPE - Purple - Scarce & 6 in. bowl is VERY scarce! HEAVY GRAPE: Although we have previously discussed one of these 10”-11” bowls, this particular example is so beautifully iridized, we decided to display it with a recent “find” of ours. In neither case, is this a plentiful pattern, no matter if marigold, P.O. or amethyst. Ice Cream shape is considered quite scarce, but pattern-wise, as compared to many other Dugan patterns, THIS one is MORE scarce. The 5”-6” sauce size is extremely scarce in any of the three known colors! DOUBLE STEMMED ROSE - Amethyst. 9 in. DOUBLE STEMMED ROSE in Blue. DOUBLE STEMMED ROSE Bowl: This is a beauty! Some opinions are that this is the most common color. We believe marigold is less often available than celeste examples. 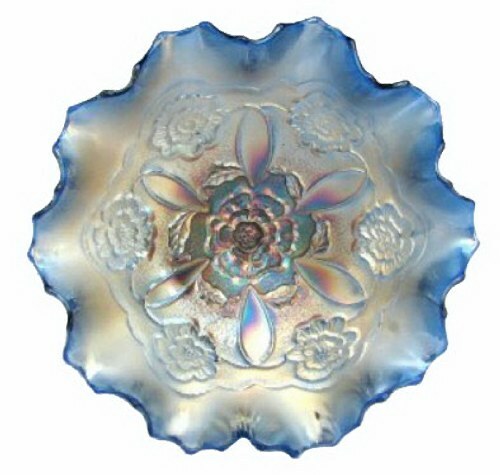 This dome-footed bowl/plate design is somewhat overlooked because the bowl is found in such a wide variety of colors: marigold, amethyst, white, peach opal, blue, green, lavender, aqua, celeste blue, olive green, ice green, cobalt blue opalescent. The domed plates are found in marigold, amethyst, white and peach opal. but they can become selfish prayers if they do not flow from a heart determined to obey God.